Pages tagged "community organizing in Los Angeles"
As a way to act on the extraordinary pressures they experience around housing, San Fernando Elementary school leaders (including twenty parents and their Principal, Maria Awakian) and One LA's education team testified before the San Fernando City Council. Publicly speaking for the very first time, three parents shared how 1 of 8 children in San Fernando area schools experience some degree of homelessness, often resulting in disruptions of academic progress and difficulties in staying awake for class. 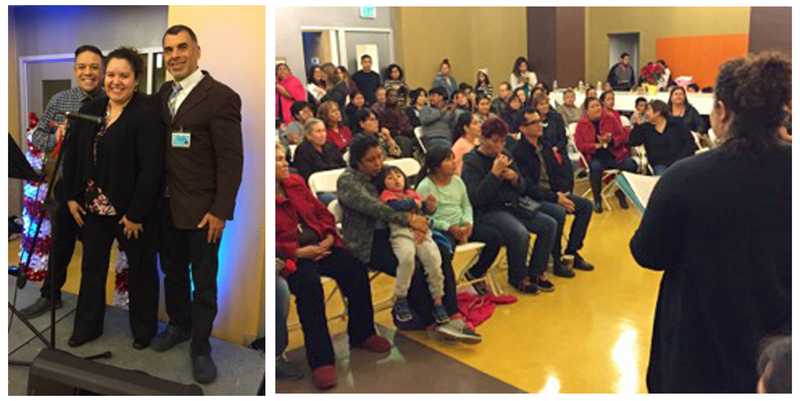 One LA Reaches Milestone Healthcare Enrollment of 146,000, Celebrates Expansion of Enrollment to 54,000 More! Before a packed audience of 200 health care leaders and Dr. Mitch Katz, Director of the LA County Department of Health, One LA celebrated the milestone enrollment of 146,000 Los Angeles residents into My Health LA, 8,000 of whom were enrolled by One LA leaders themselves at their institutions. My Health LA is a program One LA leaders compelled the County to create to cover undocumented residents and leaders ultimately secured an additional $6 million in funding and negotiated an agreement from LA County to conduct healthcare enrollment at One LA member institutions. 350 trained leaders held over 100 events to enroll the 8,000 residents. Building on a four-year campaign, One LA leaders and their allies shaped, pushed for and passed Measure M to raise $120 Billion for new rail lines, improved bus services, and street and highway projects which will create hundreds of thousands of jobs and make finding and getting to a job easier for working poor families across LA County. Passing this bond measure required meeting a challenging two-thirds voter threshold for approval. This extraordinary victory took a county-wide education and mobilization of non-traditional allies crossing significant geographic, racial, religious and socioeconomic lines. One LA leaders are leading efforts around construction of transit lines and the creation of affordable housing around new transit hubs. Leaders hosted a stakeholders gathering in collaboration with Los Angeles Mayor Eric Garcetti, drawing over 150 members of One LA congregations, schools, non-profits, unions and public and private entities. Soon after, leaders from ten One LA institutions attended the monthly Metro Board Meeting to welcome the new Metro CEO, Philip Washington, and to present their Opportunity Agenda of jobs, housing, and transit improvements. Metro, also known as the MTA, has a huge opportunity in 2016 to move each of those interests forward. 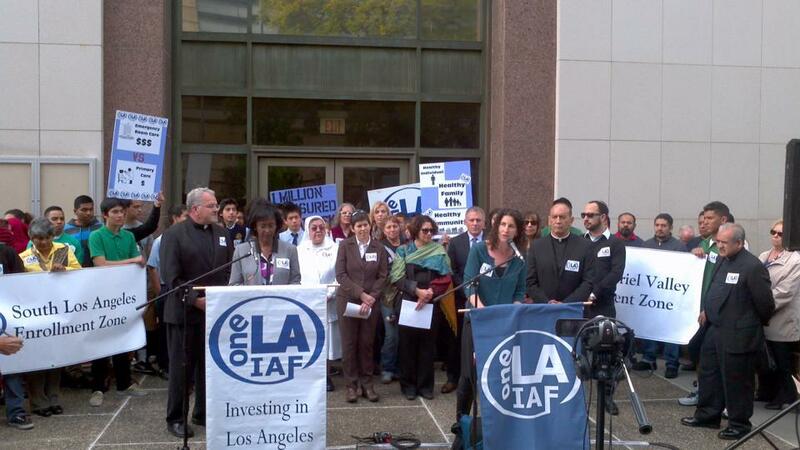 One LA looks forward to being part of the conversation around a potential 2016 ballot measure. The morning after an assembly in which hundreds of San Fernando Valley leaders of One LA leveraged commitments from District 3 candidates to ensure sufficient funding for the 'My Health LA' program, the LA County Board of Supervisors voted to invest $6 Million in additional dollars for the program. One LA estimates that the added funding will expand coverage by 35 to 40 thousand individuals. This victory comes months after the organization identified millions of County dollars that could be used to cover more uninsured people, including undocumented County residents. "After thanking board of supervisors members for their commitment to support heath care for Los Angeles County's poor, Jim Mangia, president and CEO of St. John's Well Child and Family Center, asked the people who came with him to the May 20 public meeting "to support health care for all" to stand up. Hundreds upon hundreds of "women and men from across the county rose â€” cheering, clapping, shouting and raising their hands high in the air. The grass-roots commotion went on for almost a minute."